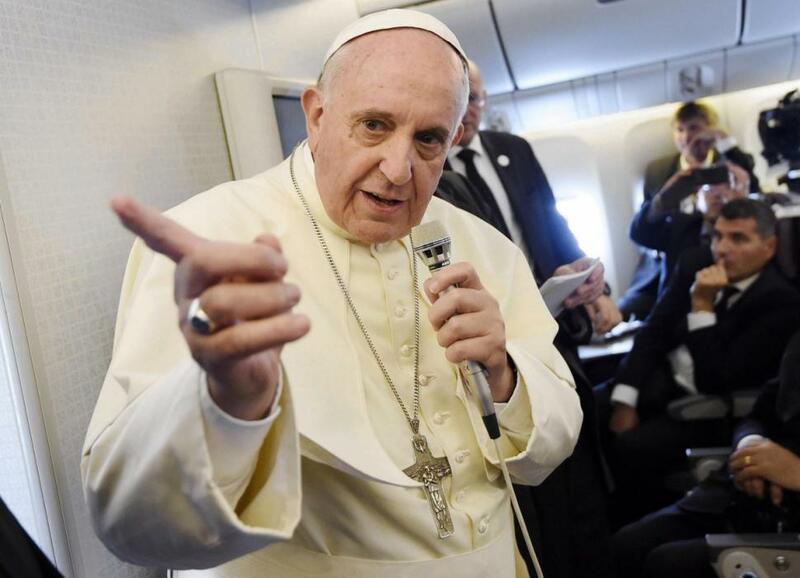 Francis also said the international community — and not just one country — should decide how to intervene. His comments on Monday represented a shift in the Vatican’s usually steadfast opposition to military force. Meanwhile, President Obama announced that Kurdish and Iraqi forces, backed by U.S. airstrikes, had recaptured the Mosul Dam. 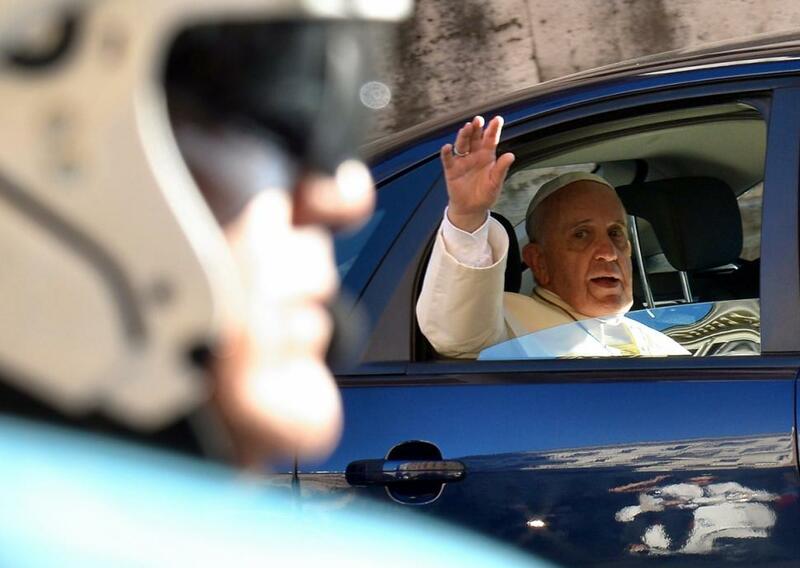 Pope Francis, seen waving from his car after a visit to St. Mary Major Basilica on Monday, said he supports use of force to stop Islamic radicals in Iraq. Pope Francis on Monday blessed the use of force to stop the vicious Islamic radicals overrunning Iraq, but he said any intervention first must be backed by the international community. His comments — in an extraordinary news conference aboard the papal plane — came as President Obama announced that Kurdish and Iraqi forces, backed by U.S. airstrikes, had recaptured the giant Mosul Dam from the extremists. The fighters with the Islamic State, also known as ISIS, have swept across northern Iraq since June, driving 1.5 million Christians and other Iraqi minorities from their homes. The retreat of the extremists from the dam represented their first major defeat in Iraq. In a question-and-answer session with reporters returning with him from a five-day trip to South Korea, Francis was asked if he supported the U.S. air strikes authorized by Obama against ISIS. “In these cases, where there is an unjust aggression, I can only say that it is licit to stop the unjust aggressor,” Francis said. Iraqi Kurdish Peshmerga fighters celebrate from the back of a truck as they head to the Mosul Dam on the Tigris river that they recaptured from Islamic State jihadists. However, the Pope went on to say that such intervention should not be decided unilaterally, by one country. Still, even with the Pope’s qualifications, his comments represented a shift in the Vatican’s steadfast opposition to military force in recent years. One single nation cannot judge how you stop this, how you stop an unjust aggressor. Last year, for example, Francis staged a global prayer and fast for peace when Obama threatened U.S. air strikes to stop the use of chemical weapons in Syria’s civil war. Christian communities in northern Iraq, which date back 2,000 years, have been evacuated as ISIS fighters took control of their towns and presented residents with a grim choice: Convert to Islam or pay a tax to avoid death. Many chose to flee. Francis said he was weighing whether to visit northern Iraq to show solidarity with the persecuted Christians there. The retaking of the Mosul dam culminated a three-day offensive by Iraqi special forces and Kurdish troops backed by U.S. warplanes and armed drones. Pope Francis added that the means of intervening in Iraq must be decided internationally, not by one country. Taking what amounted to a victory lap, Obama said the return of the dam to safe hands was evidence that his new strategy in Iraq — applying selective use of U.S. airpower but committing no U.S. boots on the ground — was working. 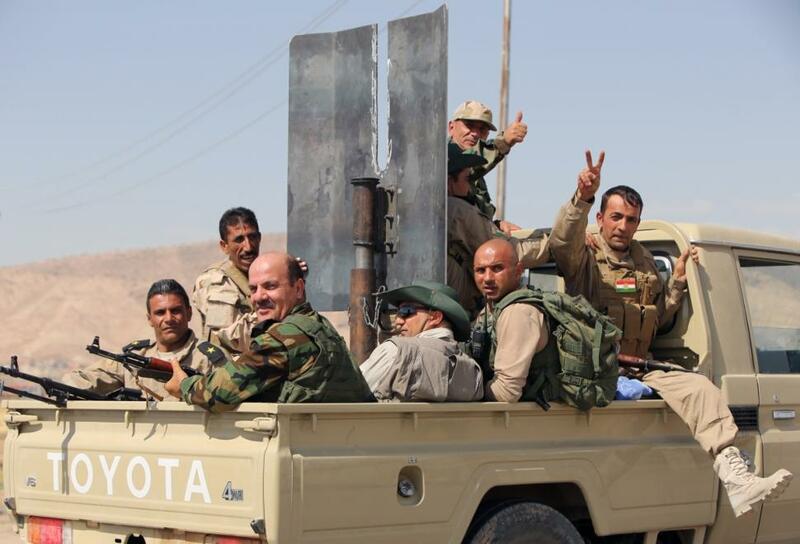 “Iraqi and Kurdish forces took the lead on the ground, and performed with courage and determination,” Obama said. “This operation demonstrates that Iraqi and Kurdish forces are capable of working together and taking the fight” to the ISIS fighters. The President, who interrupted his Martha’s Vineyard vacation to return to Washington, said if “that dam was breached, it could have proven catastrophic,” with floods threatening thousands of civilians and the U.S. Embassy in Baghdad. “We’ve got a national security interest in making sure our people are protected and in making sure that a savage group that seems willing to slaughter people for no rhyme or reason other than they have not kowtowed — that a group like that is contained, because ultimately it can pose a threat to us,” Obama said. 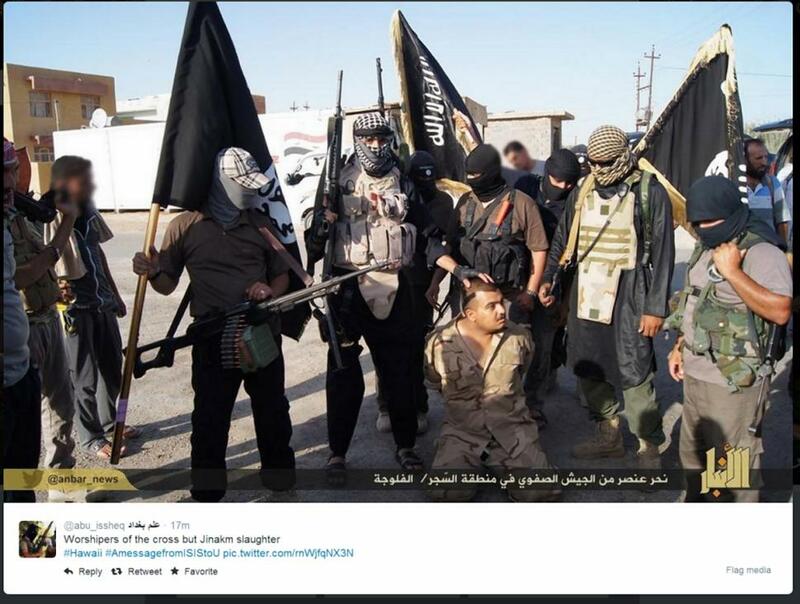 Tweets with the hashtag #amessagefromisistous show taunts from ISIS supporters to America and the West. He also urged Iraq’s political and religious factions to unify around the incoming prime minister, Haider al-Abadi, who is set to take over after the U.S. nudged Nuri al-Maliki out the door because of his divisive ways. “They’ve got to get this done because the wolf’s at the door,” Obama said. The extremists took over the dam on Aug. 7, causing alarm in Baghdad and in Washington. The seizure gave the Islamic State control over the water and power supply for millions of Iraqis. It also increased the threat of devastating flooding for Iraqis living downstream. The dam’s failure or destruction could have unleashed a 65-foot wall of water, destroying large parts of the city of Mosul and even flooding parts of Baghdad, more than 200 miles away, experts said. Obama spoke Monday after a fresh round of U.S. air strikes in support of Kurdish and Iraqi military operations on the ground. The U.S. conducted about a dozen air strikes on Monday, for a three-day total of 35, destroying more than 90 ISIS targets near the dam, the Pentagon said. The President authorized air strikes against Islamic State fighters on Aug. 8. The majority of them have been on ISIS targets near the dam. A spokesman for the Kurdish forces, Halgurd Hekmat, said Kurdish fighters, known as the peshmerga had regained full control of the dam. Shiite fighters loyal to Iraqi Shiite cleric Moqtada al-Sadr hold a position as they back the Iraqi army in the fight against Islamic State militants. At least 170 bombs and booby traps placed by the extremists near the dam were disabled but many more remained, an Iraqi official said. Obama again warned that U.S. military operations in Iraq, while not involving combat troops, would continue for the foreseeable future. “This is going to take time. There are going to be many challenges ahead,” he said. ON A MOBILE DEVICE? CLICK FOR VIDEO. Britney Spears has never been shy of the camera! A 13-year-old Spears posed for photographer David Baren in Philadelphia in this never before seen photo shoot from 1995. Exclusive video from immediately after Suge Knight’s parking confrontation prove rap impresario was target of attack, lawyer claimed. A video of girls fighting on a Williamsburg street as other teens watch has surfaced days after the infamous McDonald's six-on-one brawl. The Rangers announced Monday afternoon that forward Martin St. Louis will miss 10-14 days with a lower-body injury. "Ghostbusters" reboot director Paul Feig ain't afraid of no ghosts -- but it's the sexist pigs that make him cringe. Toxicology tests show that the Irish Setter who died after appearing at a dog show was almost certainly poisoned. Pete Rose has submitted a new request to be reinstated to baseball, according to new Commissioner Rob Manfred. The most famous quarterback who doesn’t play quarterback got another chance to show what he can do for an NFL team. Spend more time in bed and you’ll spend more time in bed. Uber's latest test program involves 25 all-electric cars and they're not Tesla's Model S P85D. Jurors in Dzhokhar Tsarnaev's Boston Marathon bombing trial of went on a field trip to a boat that turned out to be no escape from the law. 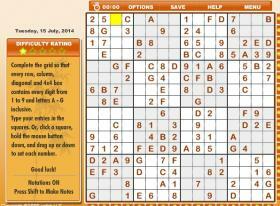 Test your skills with popular games including 7 Little Words, daily Sudoku, and crosswords.